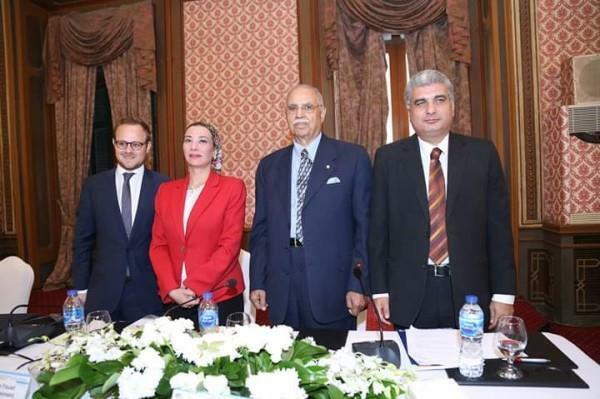 (MENAFN - Daily News Egypt) The Friedrich Ebert Foundation has concluded its 'Sustainable Transport in Egypt' conference entitled 'Cleaner Mobility and the Advent of Electric Vehicles'. Environment Minister Yasmin Fouad The conference was attended by Environment Minister Yasmin Fouad; Representative for Egypt's Friedrich-Ebert-Stiftung Country Office Richard Probst; Regional Director of the sustainable growth sector at CEDARE Hossam Allam; Representative of the New Administrative Capital on behalf of Ahmed Zaki Abdin, Mahmady Eid; Chairperson of the New Administrative Capital; Representative of the UNEP Alexandre Corner; a Jordanian delegation to present its transformation experience into electric vehicles; several Egyptian and international experts in the field of electric mobility and sustainable transport, and a few Egyptian automotive company representatives. Furthermore, Fouad is also cooperating with several local and international partners as well as with university students, to utilise their potential and projects in serving sustainable transport. The minister hopes that Egypt be successful in reducing harmful emissions within Egypt's 2030 Sustainable Development Plan. Representative for Egypt's Friedrich-Ebert-Stiftung Country Office Richard Probst Richard Probst, the Friedrich-Ebert-Stiftung representative, urged the need for a community dialogue with all stakeholders at all industry levels, including trade and environment, as well as strengthening local and international companies based on the Green Economy Roadmap for the UN, which heavily relies on innovative change in the transport sector, and shifting towards sustainable transport. Egypt has the potential to become an industry focal point, and a trading centre for electric vehicles, indicated Probst, noting that electric vehicles are one of the most prominent pillars which can have a permanent positive impact on the community's economic indicators. He also expressed great pleasure in the Egyptian government's attempt to transform according to sustainable transport, based on the use of electric vehicles, in addition to the presence of local dealers and agents of local cars convinced of the need to move towards electric vehicles, and whom have recently already started introducing models in the local market. Eid added that the New Capital will be environmentally-friendly, according to Environment Minister Yasmine Fouad's recommendations, which require using environmentally-friendly tools, including electric vehicles. He indicated that one of each lampposts will have a charger, and much more, where the New Administrative Capital will be Egypt's first smart city. Furthermore, he declared CEDARE's commitment to develop a strategic plan, in cooperation with the concerned authorities and research centres, to identify the roles and policies and build an institutional framework in order to achieve the desired objectives of sustainable transport, and the distribution of electric vehicles. Representative of the UNEP Alexandre Corner Alexander Corner, representative of the Air and Navigation Unit at UNEP, presented an e-Mob draft to enable the use of electric vehicles in developing countries, in cooperation with the Global Environment Facility, which focuses on the local potential of these countries for electric vehicles, through the infrastructure and local electric transmission project, which is working to rehabilitate 30 countries worldwide.